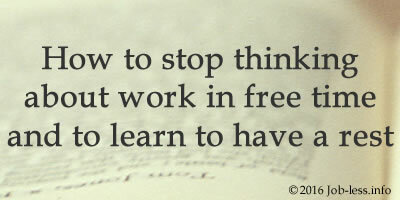 Article #5: How to stop thinking about work in free time and to learn to have a rest. When there are problems at work, even at home is difficult to stop thinking about it. This is the reason of bad mood, because it's difficult to pay worthy attention to the family, moreover, it can cause insomnia. "If you can't in time just disconnect from the problems at work, then it wouldn't lead you to something good, and the problems will only multiply," - considers Peter Shallard, a psychologist, the consultant for questions of efficiency and work organization. Here are 4 his tips which will help you to learn how to relax and will save you from emotional and professional burning out. One should always try to spend the time usefully. To think is good, but constant reflection without any result is a waste of time. If you come home after work with the filled with thoughts head, and you need half an hour or an hour to think them over and to make decisions, - do it! But after that, without fail, you should relax. Yet if your "calculations" lead to nothing, and your head starts hurting even more, it's time to do something. It's impossible to stay permanently in such state. Try to be absorbed in something interesting for you, which can occupy your mind and save you from useless thoughts. It even can help to find a solution, which you've never thought before. Being constantly focused on the problem, we sometimes start thinking too narrowly, sort a problem to pieces, but at all forget about search of the decision. So, having relaxed mind, you may find that the decision was under the very nose, and we just couldn't discern it. Shallard calls it "divergent thinking" and claims that one of his clients, whose work has been full of stress, successfully used it. He began to walk to the pool and a lot of attention paid to his shape and the results of trainings, thinking at this time exclusively about these. Distracting thus, he found solutions of problems quicker and more effectively, besides got rid of a constant stress. Thus, the psychologist explains the reason why people build small ships in glass bottles. Because when you can occupy your brain with intuitive and creative tasks, it allows you to relax, leading to the decision and other troublesome problems. Thoughts are directly connected with your emotional state. Therefore if you leave work angry, dispirited or exhausted, in such state of mind you also will spend evening if, of course, nothing changes your mood. You can buy antidepressants, but in the long term it is definitely not the best alternative. Peter Shallard recommends physical exercises, healthy food, good music, or other enjoyable way for you to elate. Gloomy reflections on a sofa certainly will not help - neither to solve a problem, nor to improve your mood. With other mood the problem can simply disappear, even if it is temporary, but it will present you a good respite. Thus we will release recently occupied psychological resources, which were inaccessible in a stressful state and which will help to find a way out of difficult situations now. Some people have decided that a discussion work questions at home is quite acceptable. Perhaps, you should establish rules in this respect. To discuss the working day at supper is normal, but again plunge into the abyss of problems and troubles isn't the same. You simply again will get to the similar whirlpool of bad mood, as in the afternoon. So, try to separate different working moments and your free time, spending with the family. Forget about the problems, after all, hopeless situations don't happen, and surely everything will be resolved. Therefore, be optimistic and learn to relax in full force!